How high? At 450 metres the sun was shining in a bluebird sky. Any higher? At 600 metres snow began to cover the road. At the highest? At 2,350 metres for 360 degrees the sun was a balmy 10 Celsius and from this height the view below was magical as we could see the layer of cloud that covered the valley bottom. 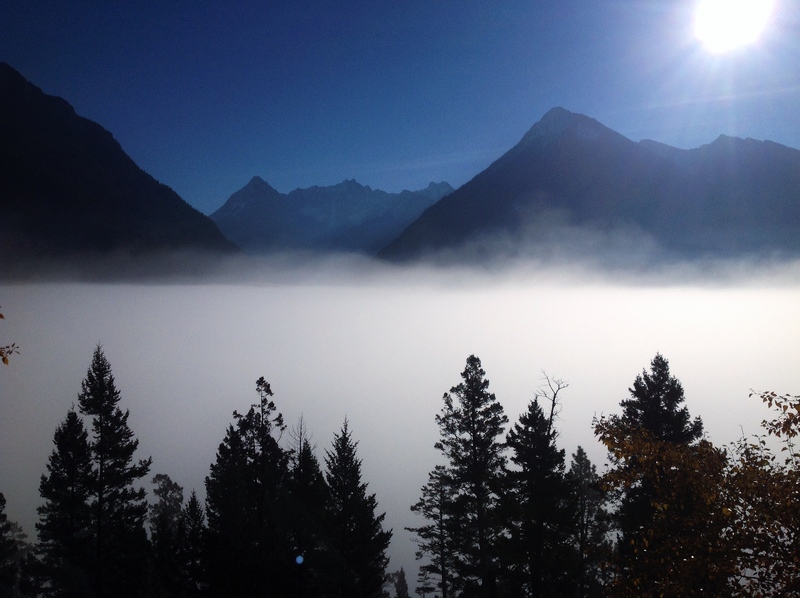 This past week Cranbrook had a temperature inversion. 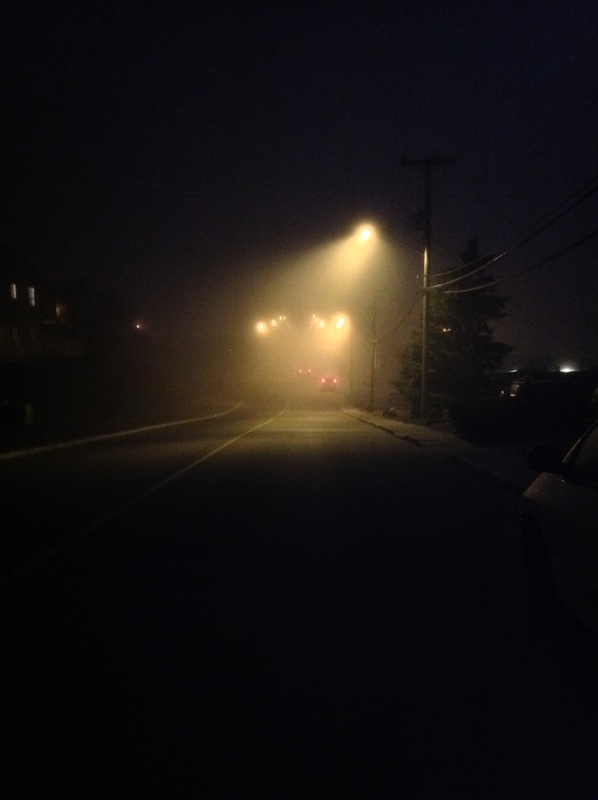 A layer of dense moist cloud rolled into the valley bottom – and stuck – which resulted in early morning ice fog and dreary days. By Saturday this layer of cloud still held Cranbrook prisoner. It was the mission of the hiking club to go in search of the elusive sun. There were four determined hikers who left a gloomy, dismal city in search of sun and blue sky. The destination was Lakit Lookout. In addition to blue sky and sun, there would be the last of the spectacular color of the Western and Alpine larch. The low cloud cover still hugged the valley bottom on the hour drive to the trail head climbing up the Wildhorse Road heading into the Rocky Mountain trench. During the slow steady climb, we watched for hints that somewhere ahead there was blue sky. 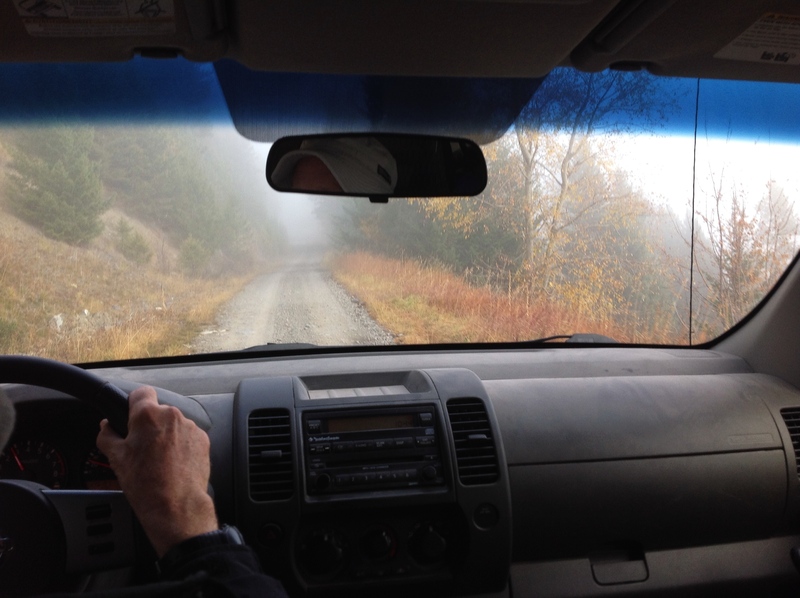 At 450 metres there were glimpses of blue thru foggy haze. All of a sudden, the layer of cloud that had held Cranbrook hostage slipped away and we could see blue sky and, most of all, the sun. Starting out in the snow. It was a beautiful bluebird sky! Because of the steepness of the hike, the trail is a series of switchbacks winding upward. 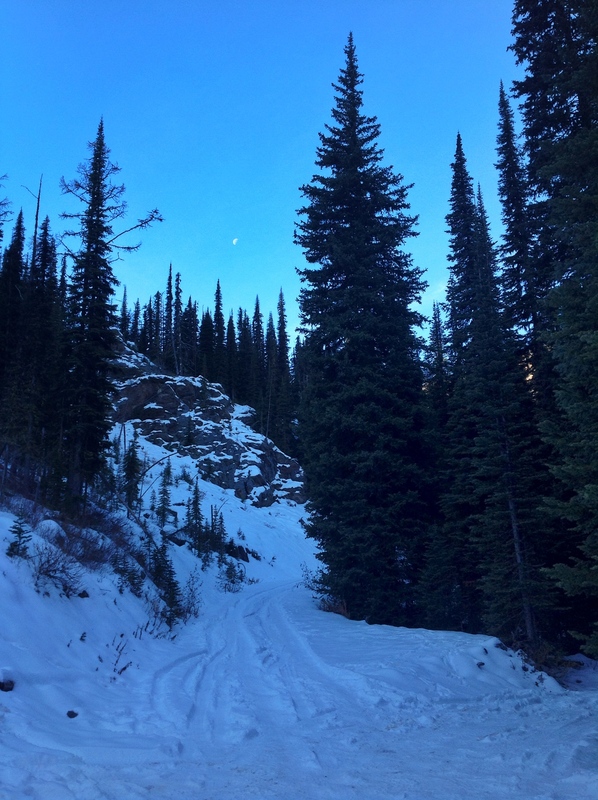 If we were on the south side, the trail was snow free but on the northside there were long patches of icy snow which made the climb slow and careful. (Note to self: make sure to carry cleats for future elevation hikes) From the north you could see Lakit mountain and the ridge and a few Alpine larch providing a rich golden color in contrast to the blue sky and white snow. Slow and careful was the key. From the south we realized why the sun could not penetrate to the valley below as the layer of cloud provided a mystical view with tops of mountains poking through and the cloud weaving between the mountains. Breathtaking! Cranbrook is somewhere below. Baker Mountain in in the centre. Cone Mountain on the left. At 2,350 metres the lookout appears. Originally it was constructed as a fire lookout but now provides shelter to hikers and skiers. A drawer in the lookout contains log books dating through the years and signed by people who have reached this summit and left comments about the beauty of the vista surrounding them. With a lingering look back drinking in the beauty this vista provided, it was time to head downward. 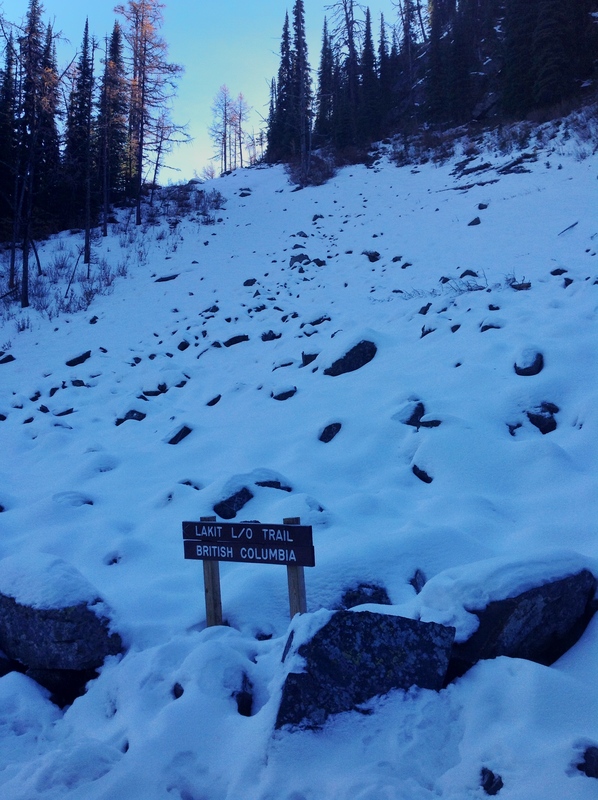 It was easy going on the south switchbacks but care had to be taken traversing the snowy patches on the north. (Remember those cleats) As we decended the road down, the fog rose up to met us and once again obliterated the blue sky and sun. This hike was a metaphor about life. Sometimes we become imprisoned in a web of the routine and the mundane of the day to day. Gently, we must be reminded that amidst the struggles of the valleys, if we peel back the layers and go higher there are many blessings and joyful moments that will meet us along the way. 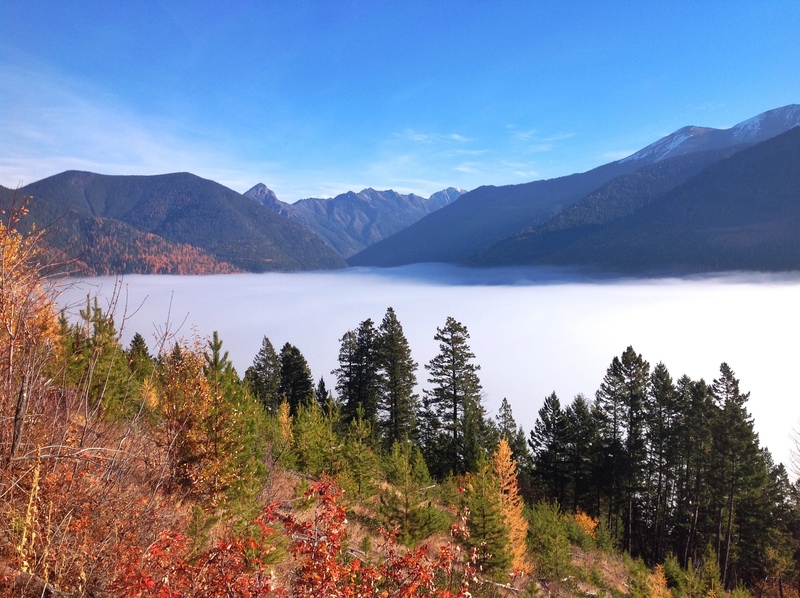 This entry was posted in Beauty, Color, Finding Joy, Fun, Hiking, ipad, Out My Backdoor, Phonegraphy, Photography and tagged BC, East Kootenays, enjoyment, happiness, hiking, journey, joy, Nature, Out My Backyard, Phoneography, Photography, walking, WOW. Bookmark the permalink.